Business owners for enterprises of all sizes are struggling to find the next generation of solutions that will unlock the hidden patterns and value from their data. Many organizations are turning to artificial intelligence (AI), machine learning (ML) and deep learning (DL) to provide higher levels of value and increased accuracy from a broader range of data than ever before. 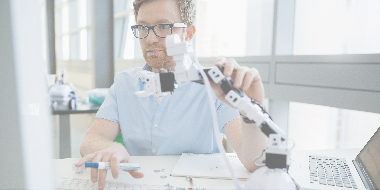 They are looking to AI to provide the basis for the next generation of transformative business applications that span hundreds of use cases across a variety of Industry verticals. AI, ML and DL have become hot topics with global IT clients. They are driven by the confluence of next-generation ML and DL algorithms, new accelerated hardware and more efficient tools to store, process and extract value from vast and diverse data sources that ensure high levels of AI accuracy. However, AI client initiatives are complex and often require specialized skills, ability, hardware and software that is often not readily available. Trusted advisors such as systems integrators (SIs) are building the next generation of AI solutions for clients. SIs are being called upon to integrate best of breed parts to accelerate AI projects, driving the need to rapidly ramp up their own internal skills, capabilities and thought leadership around the multiple components of AI solutions. In addition, clients rely heavily on trusted SIs to clarify and demonstrate how business problems can truly benefit from today’s AI solutions and what is ‘not quite there yet’. Taking a new AI project, with a broad suite of AI models, through the entire “AI lifecycle” of design, development, proof of concept, deployment and production, as well as integrating the new AI functionality into existing client transactional systems, is the ‘sweet spot’ for SIs. As SIs move from the build-up phase to ramping up their AI skills, experience and IP associated with integrated and complex solutions, it becomes very important for SIs to leverage highly skilled partners such as IBM. IBM provides a broad range of industry-leading AI solutions. It includes both the software and the hardware infrastructure that are deeply optimized for a complete production AI system. Partnering with IBM’s AI offering teams sets the stage for SIs to establish their AI leadership by enabling delivery of an entire suite of brand new AI assets. IBM’s new PowerAI Enterprise is a unique solution which makes DL and ML more accessible to clients. PowerAI Enterprise is a complete environment for “data science as a service”, enabling SIs to accelerate the build of more accurate AI applications for clients. It also accelerates the performance of those applications when running in production. 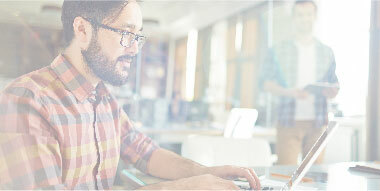 PowerAI Enterprise combines popular open source DL frameworks and efficient AI development tools, and enables AI applications to run on accelerated IBM Power Systems™ servers. 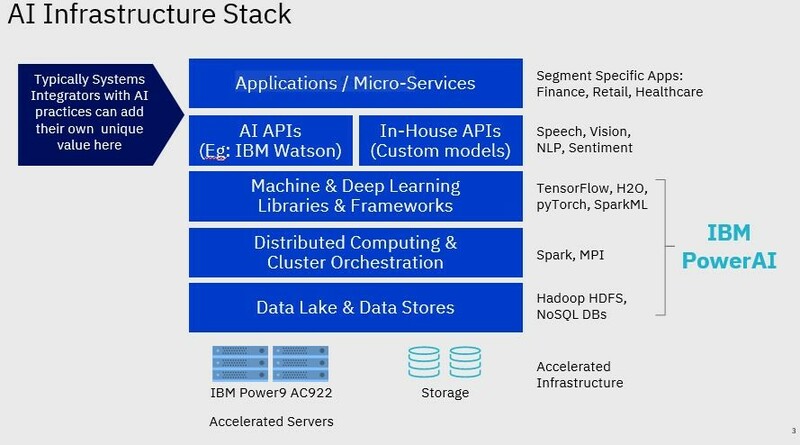 PowerAI’s focus is to provide the comprehensive hardware and software infrastructure required to support new and demanding client AI applications, what IBM calls ‘The AI Infrastructure Stack’ (see diagram below). This stack spans components from servers all the way to ML/DL software. 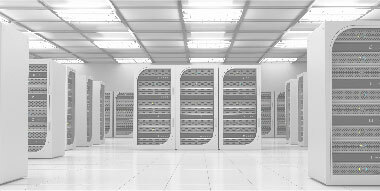 Since modern AI methods usually use GPU-acceleration, IBM has built a server optimized for AI, the IBM Power Systems AC922 server with POWER9 architecture, that has a high-speed connection between the POWER9 CPUs and the NVIDIA GPUs. PowerAI running on Power Systems, combined with NVDIA GPUs and NVLink technology, enables SIs to rapidly deploy a fully optimized AI platform that delivers blazing performance, proven dependability and resilience, and it is fully supported by IBM. SIs can easily add their own unique incremental value on top of PowerAI, resulting in their own competitive advantage in the rapidly growing AI systems integrator marketplace. We invite you to take the next step to learn more about PowerAI Enterprise here: https://www.ibm.com/us-en/marketplace/deep-learning-platform. For additional information, also check IBM SmartSeller, available to IBM Partners, here.